The holes in lotus seedheads elicit feelings of discomfort or repulsion in some people. Trypophobia is an aversion to the sight of irregular patterns or clusters of small holes, or bumps. It is not officially recognized as a mental disorder, but may fall under the broad category of specific phobia if fear is involved and the fear is excessive and distressing. People may express only disgust or both fear and disgust to trypophobic imagery. The understanding of trypophobia is limited. Although few studies have been done on trypophobia, researchers hypothesize that it is the result of a biological revulsion that associates trypophobic shapes with danger or disease, and may therefore have an evolutionary basis. Exposure therapy, which has been used to treat phobias, has been proposed as a treatment. The term trypophobia is believed to have been coined by a participant in an online forum in 2005. Since then, the topic of trypophobia has become popular on social media. Trypophobia is not recognized by name as a mental disorder, and so is not a specific diagnosis in the American Psychiatric Association's Diagnostic and Statistical Manual, Fifth Edition (DSM-5). However, it may fall under the broad category of specific phobia if the fear is excessive, persistent, and associated with significant distress or impairment. Whether trypophobia can be accurately described as a specific phobia might depend on whether the person mainly responds with fear or with disgust. Because phobias involve fear, a response to trypophobic imagery that is based mostly or solely on disgust renders its status as a specific phobia questionable. In one study, most of the participants with trypophobia met the DSM-5 criteria for specific phobia, even though they experienced disgust instead of fear when shown imagery of clusters of holes; however, they did not meet the distress or impairment criterion. Trypophobia often presents with an autonomic nervous system response. Shapes that elicit a trypophobic reaction include clustered holes in innocuous contexts, such as fruit and bubbles, and in contexts associated with danger, such as holes made by insects and holes in wounds and diseased tissue such as those caused by mango worms in animals, especially dogs. Upon seeing these shapes, some people said they shuddered, felt their skin crawl, experienced panic attacks, sweated, palpitated, or felt nauseated or itchy. Other reported symptoms include goose bumps, body shakes, feeling uncomfortable, and visual discomfort such as eyestrain, distortions, or illusions. Trypophobia may manifest as a reaction of fear, disgust, or both. Disgust is usually the stronger emotion in those with trypophobia. The understanding of trypophobia is limited. Several possible causes have been proposed. Geoff Cole and Arnold Wilkins believe the reaction is an "unconscious reflex reaction" based on a biological revulsion, rather than a learned cultural fear. Imagery of various venomous animals (for example, certain types of snakes, insects, and spiders) have visual characteristics similar to trypophobic imagery. Because of this, it is hypothesized that trypophobia has an evolutionary basis meant to alert humans of dangerous organisms. Can et al., however, believe the connection between trypophobia and evolution as a result of a threat from deadly creatures to be weak and that, if it does exist, it manifests later in life. Martínez-Aguayo et al. described trypophobia as usually involving "an intense and disproportionate fear towards holes, repetitive patterns, protrusions, etc., and, in general, images that present high-contrast energy at low and midrange spatial frequencies." Cole and Wilkins also stated the imagery has high spatial frequency with a greater energy at midrange. Whether together or separate, it appears that low and midrange spatial frequencies are necessary for inducing trypophobic reactions. Based on the imagery's visual cues, An Trong Dinh Le, Cole and Wilkins developed a symptom questionnaire that they believe can be used to identify trypophobia. Researchers have also speculated that trypophobic reactions could be perceived as cues to infectious disease, which could be alerts that give one a survival advantage. In a study by Kupfer and Le, trypophobic and non-trypophobic participants showed significant aversion to disease-relevant cluster images, but only trypophobic participants displayed significant aversion to disease-irrelevant cluster images. Martínez-Aguayo et al. stated that, because the reactions could not be attributed to different sensitivity levels or neuroticism differences, Kupfer and Le believe it supports their hypothesis that trypophobia is "an overgeneralized aversion towards cluster stimuli that indicates a parasitic and infectious disease threat". Yamada and Sasaki also propose that trypophobic reactions are due to the imagery's visual similarities to skin diseases. Whether trypophobia is associated with obsessive–compulsive disorder (OCD) has also been studied, but a significant minority of those with trypophobia meet the DSM-5 criteria for obsessive–compulsive disorder. Martínez-Aguayo et al. stated that other findings refer to trypophobia having common comorbid psychiatric diagnosis, such as major depressive disorder or generalized anxiety disorder, although Le et al. felt that general anxiety does not cause trypophobia. There are no known treatments for trypophobia, but exposure therapy, which has been used to treat phobias, is likely to be effective for treating trypophobia. The extent to which trypophobia exists is unknown, but the available data suggests that having an aversion to trypophobic imagery is relatively common. 16% of a sample of 286 participants in a 2013 study reported discomfort or repulsion when presented with an image of a lotus seed pod and its authors found that non-trypophobic individuals also experienced more discomfort when viewing trypophobic imagery than when viewing neutral images. Trypophobia appears to be more prevalent in women. The term trypophobia is believed to have been coined by a participant in an online forum in 2005. The word is from the Greek: τρύπα, trýpa, meaning "hole" and φόβος, phóbos, meaning "fear". Groups on social media sites such as Facebook and Instagram exist for self-identified trypophobics to share and discuss images that they say induce the reaction. Because trypophobia is not well known to the general public, many people with the condition do not know the name for it and believe that they are alone in their trypophobic reactions and thoughts until they find an online community to share them with. 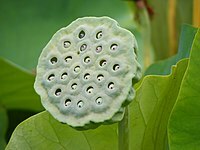 This has led to an increase in trypophobic images on social media; in some cases, people seek to intentionally induce trypophobia in those who have it by showing them trypophobic images, with the most trypophobic-inducing images being holes and clusters (especially the lotus seedhead) photoshopped onto human skin. Cole and Wilkins also stated that the level of disgust with trypophobia increases if the holes are on human skin. Writing in Popular Science, Jennifer Abbasi argues that emotional contagion within such social media groups may be responsible for some of the aversive reactions to such images. In 2017, trypophobia received media attention when American Horror Story featured a trypophobic character and trypophobia-inducing advertisements promoting the storyline; some people were disturbed by the imagery, and criticized the show for "insensitivity towards sufferers of trypophobia". Although there was sentiment that the increased media attention could lead to people trying to induce trypophobia, there were also opinions that it might help people understand trypophobia and encourage more research on the matter. Writer and editor Kathleen McAuliffe suggested that trypophobia is yet to be extensively studied because researchers have not given as much attention to topics of disgust as they have to other areas of research, and because of the revulsion viewing the images could incite in researchers. ^ a b c d e f g h i j k l Milosevic, Irena; McCabe, Randi E. (2015). Phobias: The Psychology of Irrational Fear. ABC-CLIO. pp. 401–402. ISBN 978-1610695763. Retrieved October 25, 2017. ^ a b c d e f g h i j k l m n o p q r s t u v w Martínez-Aguayo, Juan Carlos; Lanfranco, Renzo C.; Arancibia, Marcelo; Sepúlveda, Elisa; Madrid, Eva (2018). "Trypophobia: What Do We Know So Far? A Case Report and Comprehensive Review of the Literature". Frontiers in Psychiatry. 9: 15. doi:10.3389/fpsyt.2018.00015. ISSN 1664-0640. PMC 5811467. PMID 29479321. This article incorporates text by Juan Carlos Martínez-Aguay, Renzo C. Lanfranco, Marcelo Arancibia, Elisa Sepúlveda and Eva Madrid available under the CC BY 4.0 license. ^ Le, An T. D.; Cole, Geoff G.; Wilkins, Arnold J. (January 30, 2015). "Assessment of trypophobia and an analysis of its visual precipitation". Quarterly Journal of Experimental Psychology. 68 (11): 2304–22. doi:10.1080/17470218.2015.1013970. PMID 25635930. ^ a b c d e f Abbasi, Jennifer (July 25, 2011). "Is Trypophobia a Real Phobia?". Popular Science. Retrieved October 2, 2012. ^ a b Cole, Geoff G.; Wilkins, Arnold J. (October 2013). "Fear of Holes". Psychological Science. 24 (10): 1–6. doi:10.1177/0956797613484937. PMID 23982244. ^ "Everything You Should Know About Trypophobia". Healthline. August 7, 2015. Retrieved October 26, 2017. ^ Kupfer, TR; Fessler, DMT (19 July 2018). "Ectoparasite defence in humans: relationships to pathogen avoidance and clinical implications". Philosophical Transactions of the Royal Society of London. Series B, Biological Sciences. 373 (1751): 20170207. doi:10.1098/rstb.2017.0207. PMC 6000138. PMID 29866920. ^ Doucleff, Michaeleen. "Fear Of Cantaloupes And Crumpets? A 'Phobia' Rises From The Web". NPR. Retrieved 10 Apr 2016. ^ a b c d e LaMottef, Sandee (September 14, 2017). "TV show triggers little-known phobia". CNN. Retrieved October 26, 2017. ^ King, Eric (September 6, 2017). "American Horror Story: Cult: Why is Ally afraid of small holes?". Entertainment Weekly. Retrieved October 26, 2017. ^ a b Pavey, Harriet (September 5, 2017). "What is trypophobia? Bizarre fear of small holes featured in new American Horror Story series". London Evening Standard. Retrieved October 26, 2017. ^ Kathleen McAuliffe (2016). This Is Your Brain on Parasites: How Tiny Creatures Manipulate Our Behavior. Houghton Mifflin Harcourt. p. 154. ISBN 978-0544193222. Retrieved October 25, 2017. Look up trypophobia in Wiktionary, the free dictionary.